When many westerners arrive in Beijing or Shanghai, their suspicion that all Chinese really are the same is quickly confirmed. The fact that 92% of China’s population identify themselves as Han, almost seems like an underestimate at first glance in the subway station as the homogeneous mass of tanned skin and black hair surge onto the train. Today I want to challenge this misconception. Despite first impressions, there are huge regional differences in China. As with all ethnic groups, the idea of a single common “Han” people is a social construction, not scientific one. Throughout history the definition of “Han” has been murky. Generally Han referred to a group of people who recognized the current leader, engaged in agriculture, and used Chinese characters. A town could become Han within a few generations and become accepted as a part of the “us” group. As one of my professors in college pointed out (without much applause from the mainland), Confucius’s mother was from a recently conquered tribe, and very likely did not come from a family that would have described themselves as Han. And yet, Confucius came to define the culture itself as it absorbed various groups and ideas under a single label. You’ll notice the lack of a very important phrase from the paragraph above, “assimilation.” While many of the groups identified as Han share a written language, strong regional identities undermine the concept of a unified culture (I’ve written a little before about regional identities). And we're just talking about the Han regions; beyond that, China is even more diverse. This starts to become apparent in just a few visits to different major cities in China. Even those with strong Mandarin abilities might find themselves hard pressed to understand the local dialects as they travel. I was reminded of this on my recent trip to Chengdu where I had to struggle just to understand a fraction of the conversation. The same is true in many of the other traditionally “Han” regions, with Shanghai and Guangdong having particularly strong affinities for their local language. As you get further from the coast the differences start to appear at ever smaller distances. A group of students from my campus once visited a village just 45 minutes from the university only to find that none of them could communicate with the locals. This is even more impressive given that the group wasn’t limited to students from a single area or ethnic group, yet still no understanding could be reached. Student from Guangxi counting from 1-10 in Putonghua, Guiliuhua, Zhuang, Baihua and finally English. Local dialects are just a small symbol of the deeper regional differences that exist between China’s billions of Han. Food, art forms, architecture, traditions, religious beliefs, physical appearance…the list goes on and on. 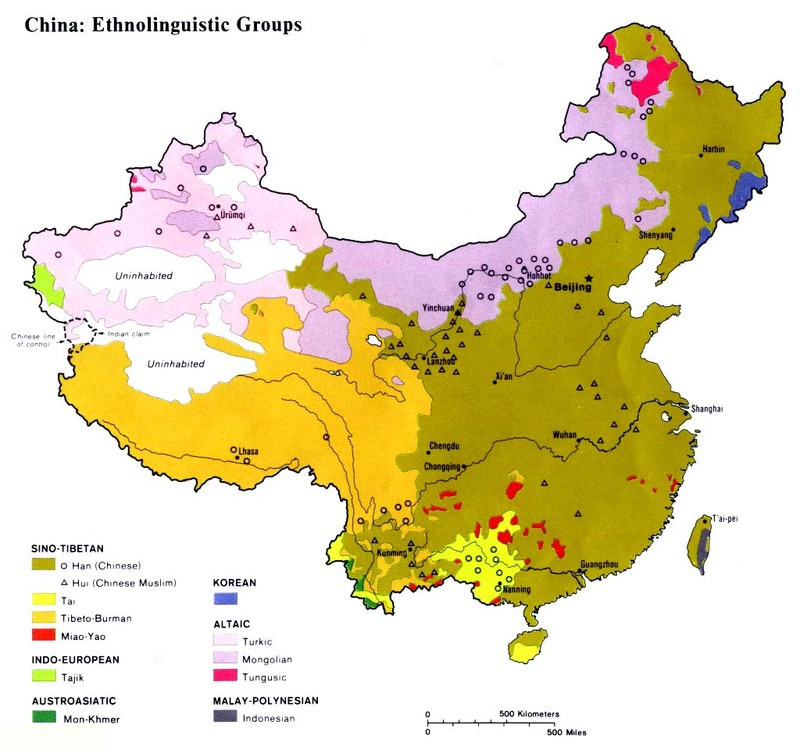 Like the dialects, there are some common threads that run through the social fabric of Han culture, but in my opinion, it’s the differences that give China it’s cultural richness (I’m not the only one who feels this way). It’s one of the great joys of exploring all of China, and it’s one that too many people miss on their quick trips. Meanwhile the Party is pushing for a single national language: Mandarin or as it’s known in Chinese, Putonghua – the common language. In places like Nanjing, the local language has already started to lose its traditional flavor, to the point that sometimes it is impossible to tell if a local is speaking dialect or Putonghua. Even in performances of “traditional” songs and dances, most of the tradition has been lost in the process of repackaging art for tourists. Electric guitars and Beijing accents accompany too many of these pieces as modernity slowly eats away at these cultural treasures. I hope the next time you get the chance, you try exploring a place where Mandarin has never been spoken in daily life, and enjoy the traditional treats while they still remain. Tomorrow we’ll be looking at Beijing’s unsuccessful attempt to spread Mandarin, and explore whether or not unity actually serves the Party. By T in Uncategorized on January 5, 2012 . When you have one government, it tends to try and pretend there is one culture regardless of facts on the ground. That is how German and French got standardized. In China, this is probably the reason to use Kanji which doesn’t change meaning between regions. BTW, are people in the various regions loyal mostly to the region, or to China as a whole? Would they split if they had the chance? There are a few exceptions, but when a Chinese person leaves the country, they would always identify themselves as Chinese. Within China though, the regional differences become more important. It’s not entirely different from what you would have seen in the US maybe 40-50 years ago, if the settlers had arrived a few thousand years earlier. The ‘Baihua’ in the video is actually Cantonese (广东话). Baihua (白话) just refers to vernacular language, which I suppose the speakers regard as Cantonese in that area. The Cantonese in this area though had several phonetic differences from the more standard versions of Cantonese you’d here around HK or Guangzhou. So I used “Baihua” since it is more of a dialect of dialect, and it is what the locals called it.